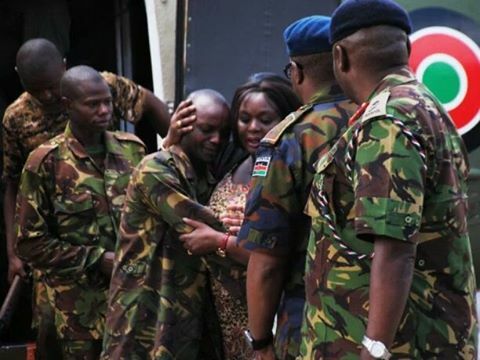 Kenyan’s on social media have applauded the Defense Cabinet Secretary, Ambassador Raychael Omamo after a picture of her comforting a KDF soldier surfaced online. Many social media users have described the CS as a mother-figure with a warm heart given the way she was welcoming the soldiers back into the country. Amb Omamo could be seen warmly hugging the soldiers, majority of who were survivors of the deadly Al Shabaab attack that left dozens dead, as they embarked from a military air craft. Such a big heart,wish all leaders would be like her.